TOS-1A (Solntsepyok) is a Russian heavy Thermobaric Flamethrower. Photos: Defence File. TOS-1A is a heavy thermobaric flamethrower, a very terrifying weapon. It was proven in Syria first, it was introduced in the service in 1989 following the first successful test at Panjshir's Valley during Soviet-Afghan War. The TOS-1A is a 220 mm 30-barrel or 24-barrel multiple rocket launchers and mountable on a T-72 tank chassis. The weapon is designed based on the warfare's concepts to liquidate completely the enemy personnel in fortifications, open terrain, or in armoured combat vehicles. 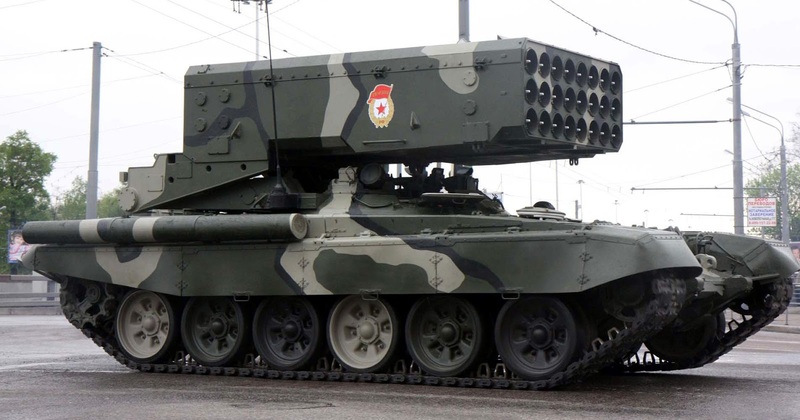 Russian TOS-1A is the only thermobaric flamethrower ever exist. The TOS-1A was revealed for the first time in public in 1999 at Omsk. The performance of this type of weapon in real combat situations especially in Syria where it rained a hell of inferno on ISIS and its rebel outfits by incinerating their military installations such as bunkers and sophisticated heavy weaponry supplied to them. The weapon has impressed many include Saudi Arabia, who now made 3.5 billion arms deal with Russia to get the firepower. The TOS-1 is a reactive salvo-fire system (MLRS) consists of a combat vehicle, rocket launcher and a transport-loading vehicle. It designed with the purpose to disable lightly armoured and automotive vehicles with equivalent arson to destroy military installations such as bunkers, fortification buildings, and destroy enemy personnel. Angle of elevation, degrees. - Thirty; pit width, m - 2.8; wall height, m - 0.85; ford depth, m -1.8. The burning projectile fired by thermobaric flamethrower system is capable of making life a living hell for anyone within its reach. Aptly dubbed “Solntsepyok” (Sunheat). It has gained a uniquely nasty reputation because of the horrifying effects of its fuel-air explosive warheads. The TOS-1A fires thermobaric rockets, which disperse a cloud of flammable liquid into the air around the target, and then ignite it. The resulting explosion is devastating, radiating a shockwave and fireball up to several meters in diameter. A thermobaric explosion is useful against troops in the open but especially useful against troops in bunkers, trenches, and even armoured vehicles, as the dispersing gas can enter small spaces and allow the fireball to expand inside. The effect of their explosion is absolutely devastating as the blast lasts significantly longer and the resulting shockwave is much hotter and more powerful than anything other conventional warheads can boast of. As if that was not enough, all the oxygen in the vicinity of the explosion is also consumed creating a partial breathable vacuum leading into death as a result of asphyxia. Russian heavy Thermobaric Flamethrower, TOS-1A (Solntsepyok) ''sunburn'' spiting hellfires. All this makes the TOS-1A a horrifying weapon against enemy personnel hiding in bunkers and caves and has earned it the well-deserved title of “the most devastating explosive weapons short of tactical nuclear weapons around.” Vladimir Medvedev, the chief designer at SPLAV R&D Association, which developed the system’s missile, told Zvezda TV that it was originally meant to have a range of 3.,5 km (2.3 miles), but was later upgraded to fly up to six km (three miles). The minimum range of 600 meters (yards) was preserved though, which means that the Solntsepyok can fire virtually point-blank. The missile travels along a very steep trajectory literally “falling” on an enemy’s head. Targeting is done with the help of an optical sight with a laser rangefinder and ballistic calculator. 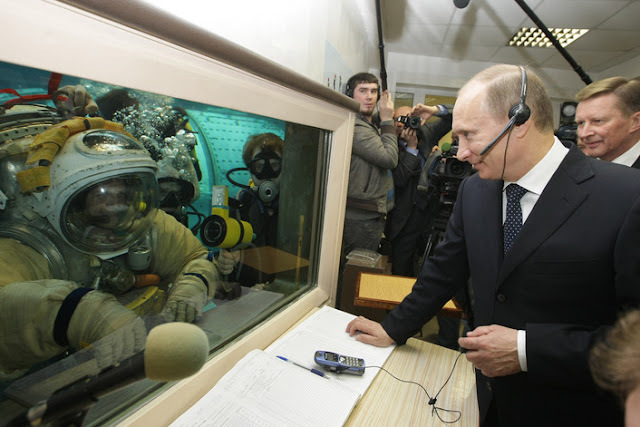 They position the launcher at a proper angle and all the operator needs to do is pull the trigger. A single TOS-1A packs more firepower than several 18-howitzer batteries. Fire preparation is just a tiny fraction of what conventional multiple rocket launchers need to open up. 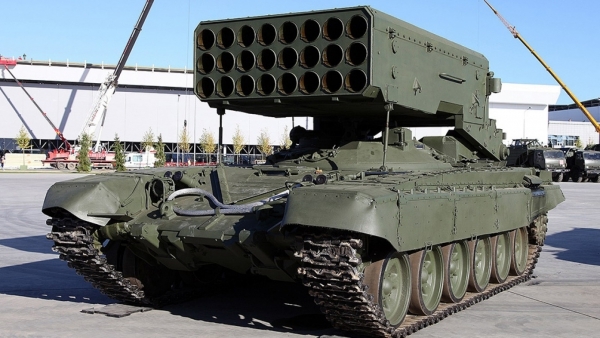 The TOS-1A is the only such thermobaric flamethrower ever around, but Vladimir Medvedev believes that the impressed created by Thermobaric Flamethrower's performance in Syria it encourages foreign weapons designers to start developing their own models replicating the system. Meanwhile, unwilling to rest on its laurels, the SPLAV designers are already setting their sight on another new generation of heavy flamethrower systems lovingly dubbed “Tosochka” (Baby TOS). In addition to the TOS-1A’s predecessor, the Tosochka, already included in the 2018-2025 State Armament Program, will also have a wheeled chassis making it ideal for use in the desert and for potential buyers from the Middle East like Saudi Arabia. The Tosochka was showcased during the Army —2017 international. 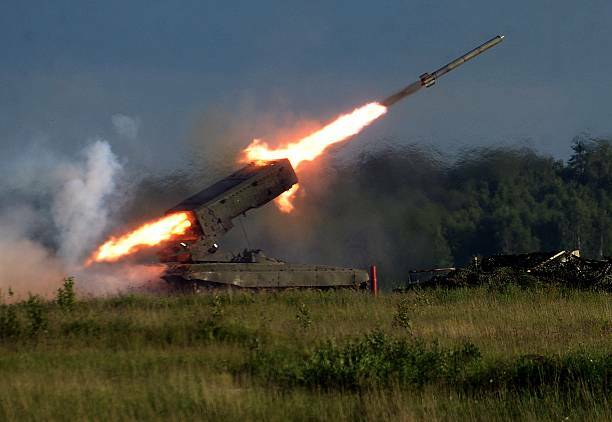 Saudi Arabia has placed an order and now received its first batch of heavy flamethrower systems from Russia, the state-run RIA Novosti news agency reported Wednesday. Russia signed a deal to supply its “Sunburn” military equipment to Saudi Arabia in 2017. Which first developed in 2001 based on the framework of a Soviet T-72 battle tank. The flamethrowing systems are intended to bolster motorized rifle and tank military divisions, RIA quoted a military source as saying.